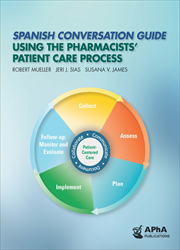 The Spanish Conversation Guide Using the Pharmacists’ Patient Care Process serves English-speaking pharmacists who wish to follow the consistent, systematic Pharmacists’ Patient Care Process (PPCP) in Spanish. The publication provides Spanish words and phrases with side-by-side English translation to promote effective and safe communication in Spanish. With the Spanish-speaking population growing larger, pharmacists wishing to provide patient-centered care must be able to communicate medication information effectively and safely to Spanish-speaking patients. Spanish Conversation Guide Using the Pharmacists’ Patient Care Process serves English-speaking pharmacists who wish to follow the consistent, systematic Pharmacists’ Patient Care Process (PPCP) in Spanish. The publication provides Spanish words and phrases with side-by-side English translation to promote effective and safe communication in Spanish. Various cultural notes that may be important and relevant when caring for Spanish-speaking patients are incorporated throughout.